IMHO, sounds like CNS is giving some on recruiting skills and getting back to proven coaching skills. Still not clear how all the pieces will fit together especially on D.
NOTE: Fixed earlier link which was wrong. Sorry about that! CNS knows he let a natty get away. Worst performance in a long time. Just hope the changes prove worthwhile and productive. Could be because Vinnie is a grad assistant and not a "hire." I couldn't get the story to pull up. RTR! 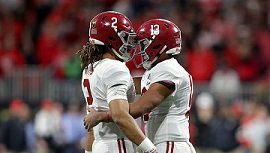 Alabama has added four new assistant coaches to its staff in Charles Kelly, Sal Sunseri, Kyle Flood and most recently Charles Huff, sources confirmed to ESPN. I want to know; does anybody know how good these coaches are other than Coach Sunseri? RTR! Great answer NALT. He does or he wouldn't hire them I don't imagine. RTR! IMHO, sounds like CNS is giving some on recruiting skills and getting back to proven coaching skills. Probably a solid strategy for the last couple years of a career. Holmon Wiggins isn't exactly a household name, but if he was the WR at Memphis before that, he can't be too bad. That was my reaction too 2.... In fact, most of these hires aren't household names or, on the surface, obvious choices. But I always figure CNS has a list of coaching candidates in his desk drawer and isn't starting from scratch when openings come. It's amazing how quickly he can fill openings. Time will tell how good they are at coaching up our players. I'm still wondering how all these changes will affect Feb signings. Still a couple of top guys out there. I hope he teaches our WR's how to push without being caught like Clemson does. RTR! Page created in 0.323 seconds with 31 queries.